Iridescent clouds Salta Province, Western Argentina captured near sunset by Dallas Rhodes of Georgia USA. 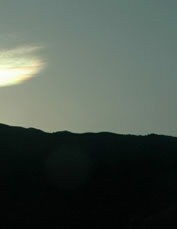 Iridescence in clouds most often occurs close to the sun. It is best seen when the sun is hidden. Here it behind the hill at right of centre. Image ©Dallas D. Rhodes, shown with permission.  The usually delicate colours can be in almost random patches or bands at cloud edges. They are only organised into coronal rings when the droplet size is uniform right across the cloud. The bands and colours change or come and go as the cloud evolves. They occur most often in altocumulus, cirrocumulus and especially in lenticular clouds. Iridescence is seen mostly when part of a cloud is forming because then all the droplets have a similar history and consequently have a similar size. 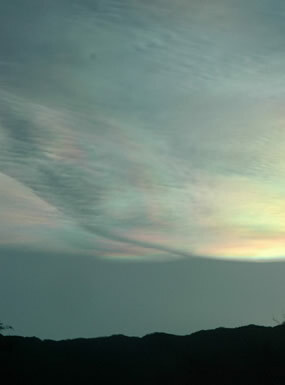 Very much rarer iridescence is that of nacreous or mother-of-pearl clouds. They can glow very brightly and are far higher than ordinary tropospheric clouds. 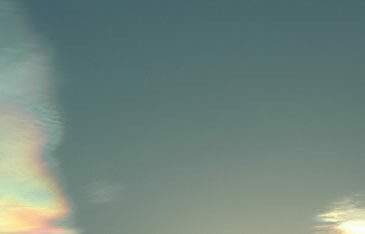 Iridescence is also seen in rocket exhaust trails.